The district of Nawada which was formally a sub-division of the old district of Gaya, came to be notified as a revenue district some time in the year 1973.The Judgeship, however as created on 21.01.1984 with Sri Phanindra Kumar Sharan as its first District and Sessions Judge. On its western border is situated the parent district of Gaya known for its religious importance for the Hindus all over the world. On the east of the district is situated the district of Jamui which was till not very late a sub-division of the old district of Munger. The district of Nawada finds on its immediate southern border the district of Koderma in the state of Jharkhand. The said National highway also touches the town of Nawada. At a distance of little more than only ten kilometers from the northern border of the district Nawada situates on the east of said national highway in the district of Nalanda the well known temple of Pawapuri where Lord Mahavir, according to the Jain belief, took Nirvana. On the north-west border of the district situates Rajgir in the district of Nalanda.Rajgir had also been the capital of the empire of Magadh in the days of Ajatashatru and the preceding kings. It also figures as a religious place in the Budhist and Jain maps. 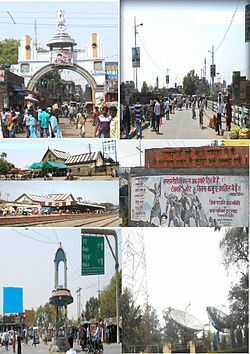 The district of Nawada which has thus got on its borders quite a few historical and mythlogical places of importance, is known in the jain religion also for the attainment of Kaivalya by the first disciple of Lord Mahavir, Sri Gautam Swami at Gunawan, a village near Nawada town, and therefore, attracts the jain pilgrims. Apart from Nawada Sadar the district has another sub-division as well named as Rajauli. The town of Rajauli situates on NH-31 nearly 35 km. south of Nawada town. At a distance of nearly fifteen kilometers further south one finds the northern border of the state of Jharkhand. In the vicinity of the town of Rajauli there are seven hillocks which, as believed by the local people, housed on their tops the Ashrams of Saptarishi. Two to three kilometers west of the National highway aforesaid and at a distance of six to seven kilometers from the town of Rajauli is situated a dam known as Fulwariya Dam meant for irrigation. The dam presents a very beautiful sight and is flanked on one of its sides by a towering hillock. But the area is supposed to be under the influence of Naxalites. The only source of substance for the people of Nawada is agriculture, as there is no industry at all. For agriculture, the farmers have to depend entirely on the rain God as there is hardly any worth mentioning irrigation system in the entire district. Fulwariya dam aforesaid is still under construction. Even tube wells are rarely to be found in the district comprised of fourteen blocks. By Air -The nearest airport from Nawada is Patna. There are regular flights from Patna to Kolkata, Delhi, Ranchi, Mumbai, Varanasi, Lucknow, and Kathmandu. Highest waterfall of Bihar present in Nawada District. At a distance of nearly fifty kilometers from the town of Nawada situates the famous kakolat waterfall known for its unique natural scenic beauty. The fall situates within Govindpur police station and block. There are several layers of the fall. Geography and history are co-related that is why Gurudev Rabindra has rightly said geography is stage and history is drama. Hence it is very essential to know the history of a country invites the knowledge of geography. 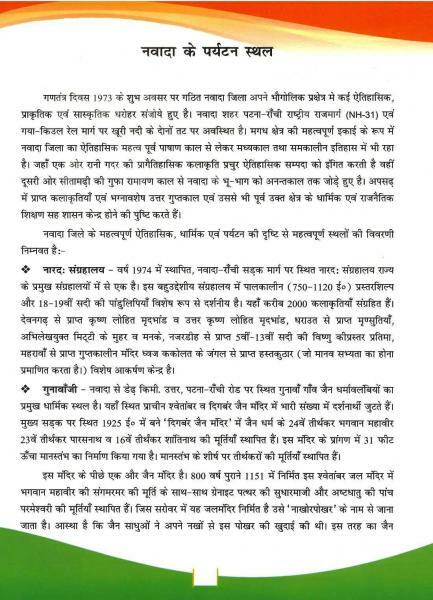 Here a glimpse of glorious historical and cultural history of nawada and its geographical strategy is countable. Nawada situated in the lap of magadh section of division enjoys its glorious past with historical imminence. King vahydrath had founded the magadh empire. Where so many dynasties like vahydrath, Morya, Kanah,Gupta, palking etc. King ruled over so many the then states of middle and North India. The might king Jarasandh Who's birthplace was Tappoban and who bought with great Pandav Bhim who was the champion among the king of the time. The history bears the testimony that Bhim has visited Pakardia village. Which is three miles away from the head quarters, Nawada. The place Sitamarhi situated in the lap of Nawada was blessed when Sita Jee made it her above in her exile and gave birth to Lava . The village Barat was the abode of great epic maker Balmiki. In the southern side of Rajauli sub-division of Nawada, Sapt-rishi had made the place for their abode. Great Lord Budha and Lord Mahavir who are regarded, as the first lights of Asia loved this place very much. The king Bimbisar was one of the most beloved disciples. Truly every inch of this place is the witness that lord Budha and Lord Mahvir gave first priority to offer their mission to this place. The historical sermon of lord Buddha was reveled for the first time here. The village Dariyapur Parvati in the Nawada District situated six miles north of Warisaliganj . There are ruins and relic of Kapotika Bodh Bihar . In the centre stands a famous temple of Avalokiteshwer. King Aditaysen founded the historical monuments in the village Apsar that is visible even today. Kurkihar enjoyed its esteemed glory in the Pal dynasty. It is about three miles North East away from Warisaliganj. Which is a small town of Nawada. In 1857 the heroes of the time had captured Nawada and paved the way for freedom. Famous "Sarvoday Asharam " is in the district of Nawada. This Asharam inaugurated by Desh Ratana Dr. Rajedra Prasad and nourished by Shree Jai Prakash Narayan has enhanced the glory of Nawada. It is situated one and half miles away from Kawakole Police station at Village Sekhodewra . The site of the asharam is beautiful with the background of hills there are also each hills. If ones stand against the highest of the hillocks and shouts, the voice is echoed book in the same very district and human like tone. In the helm of music Nawada contribution is worth mentioning rising from Thumari to Dhrupad many great musician have raised by the glory of Nawada. Padma Bhushan Prasad, Siyaram Tiwary was the master of Dhrupad and Thumari belonged to Nawada. Nawada is a beautiful and important place in the state of Bihar. Before coming into existence as a new district, Nawada was a Part within Gaya District. Historians established on the basis of analysis of evidences, that this place was a reputed religious center for the Hindus in the period of Pal. The ruler of that time was fond of making Temples and other religious spots. It is one of the reasons that there are so many temples and other religious places within this region. Nawada is located at 24.88°N 85.53°E. It has an average elevation of 80 metres (260 ft). The city is divided into two blocks by the Khoori river, the left bank being the older, while the right bank is the modern section with public offices, sub-jail, dispensary and schools.